The strongest, most secure sanitary sight glass available, Viewport's mechanically prestressed windows are available in a sanitary clamp design for sight ports in processing applications or inline visual flow indicators. Unlike some other sight glasses, Viewport sight glasses meet the USP Type 1 standard for pharmaceutical use. Described as offering the optics of glass and the strength of steel, these glass elements provide a level of safety, and a useful service life, well beyond that provided by conventional tempered glass or plastic in sanitary service. Even at the most extreme temperatures (as high as 536° F) or in overpressure situations, sudden, total failure - that involving leakage or explosive shattering of the glass - essentially never occurs. *Temperature and pressure apply to sight glass only. Viewport provides a level of safety and a useful service life, well beyond that provided by conventional tempered glass or plastic used as sight glass windows. Even in the most extreme temperature (to 572ºF using Hastelloy) or overpressure situations, sudden, total failure essentially never occurs. 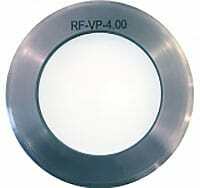 Viewport windows are formed by melting borosilicate glass into a precisely formed metal ring. As the glass cools, it solidifies, preventing the metal ring from contracting back to its theoretical size. The result is a uniform, mechanically prestressed fusion of glass and metal that combines excellent optical characteristics with greatly enhanced physical characteristics. Vital in sanitary service, the Viewport discs have an uninterrupted surface with no crevice to trap bacteria – no epoxies, resins, or glue – a true fusion. The standard surface finish is 10 Ra μ-in (0.25 Ra μm).